It has been a very busy 2017 so far for the Catch Up® team! 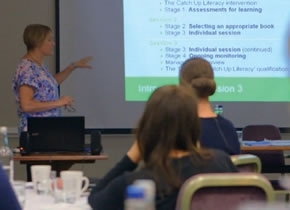 We have already delivered 39 Catch Up® training courses, welcoming almost another 500 attendees to the Catch Up® Community! What’s more, these figures are only taking into account our core ‘Delivering Catch Up®’ courses. In addition, we have welcomed back familiar faces to our ‘Review and Refresh’ training sessions, and there have been some really helpful webinars too! Our Accredited Trainers were pleased to visit some of our Regional Training Centres, schools and other venues across the UK. Courses took place in Berkshire, Cumbria, Newcastle, Nottinghamshire, Birmingham, Crewe, Glasgow, Milton Keynes, Norfolk, Swansea, Liverpool, London, Guildford, Lincolnshire, South Ayrshire, Powys, South Wales, Leeds, and Belfast! We haven’t stopped there this term! Our Catch Up team have also been busy delivering training in Australia as well! This is echoed through the feedback we receive directly from course attendees. Across all of our courses, the average trainee response to ‘How would you rate the training course overall?’ was 4.5 (with 1 being ‘poor’ and 5 being ‘excellent’)! We look forward to welcoming more trainees during the summer term - book your training now!